I’m sure you love your smartphone—but does it love you back? For some people, smartphone usage is a real danger that can cause sleepless nights, stress, and lower their quality of life. 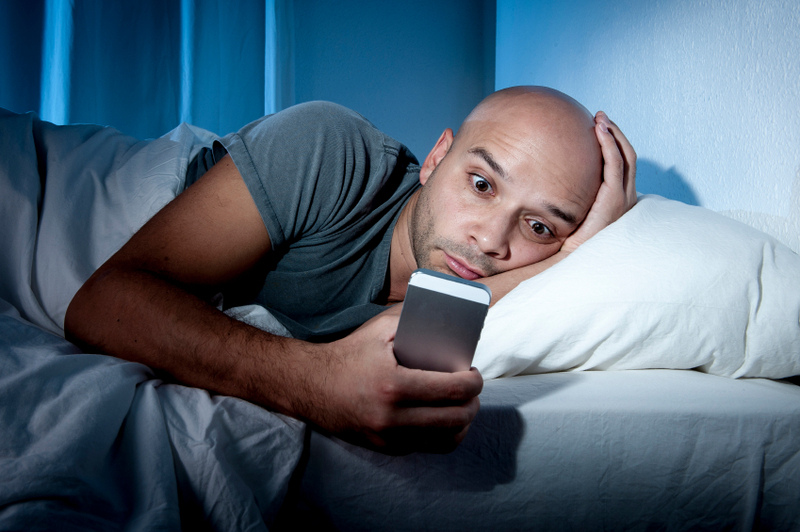 I’ve written before about how the blue light in cell phones can make it hard to sleep. The “iPhone” for example offers bright, crystal-clear graphics, which can stimulate the eyes and mess with your sleep rhythm when viewed at night. In fact, the next operating system currently in the testing phase will offer a light setting called “Night Shift” that will limit blue light exposure in the evening. And although this development could encourage better sleeping, it’s really what the phone does that keeps people awake. After all, the smartphone has become a way to connect to the world through social media, 24/7. A new study, backed by the National Institutes of Health, has identified that social media use can result in sleep disturbance. In a survey of close to 1,800 adults aged 19-32, the 30% who reported experiencing high levels of sleep disturbance were the same group who obsessively checked social media. These are people who would log on to Facebook, Twitter, Snapchat, Instagram or other social media outlets at least once per hour. Fear Of Missing Out, or “FOMO,” may have something to do with this. This describes a condition where people constantly check their social media in order to see what others are doing or what’s happening around them. The results indicate this can be quite debilitating. Oh—and it doesn’t help that these apps are readily available on smartphones. The study’s lead researcher suggests that frequently checking social media is the best indicator of sleep difficulty and that it may play as big a role as consuming alcohol and smoking when it comes to sleep quality. So if you’re noticing your sleep is being affected by your smartphone or social media use, what do you do? I think the best way to get over it is to live life in the here and now. Look at what’s in front of you, who’s around, or what you can actually do—and find value in that. Give your friends a call and actually talk to them. Find a hobby and focus on what’s tangible in your own life. So do yourself, and your health, a favor—don’t let your smartphone rule your life. “Social media use in young adults linked to sleep disturbance,” Eureka Alert! web site, January 26, 2016; http://www.eurekalert.org/pub_releases/2016-01/uops-smu012516.php. Alba, A., “Extreme social media use can cause sleep disturbance: study shows,” New York Daily News, January 26, 2016; http://www.nydailynews.com/life-style/health/social-media-sleep-disturbance-study-shows-article-1.2510432. Misener, D., “Apple iOS Night Shift feature aims to improve your sleep,” CBC News web site, January 26, 2016; http://www.cbc.ca/news/technology/apple-night-shift-sleep-1.3420379.